Commuting across Toronto's downtown core on an average weekday afternoon is frustratingly slow, costing us fuel, causing added emissions and wasting our time. This summer Torontonians saw simultaneous construction on The Gardiner, The Lakeshore, Queens Quay, King, Richmond, and Adelaide making east-west commuting a nightmare. Streetcars, at times, travel through downtown at less than 10km/h and bunch together due to left-turners and high volume. 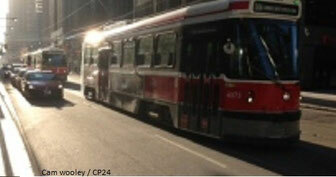 As a result, frustrated drivers make dangerous attempts to get around slow moving streetcars. Bikes have no safe east-west lane through the city, especially during rush hour when all lanes open to car traffic. I have a solution that can help ease our congestion problem without having to wait for years of costly construction. I propose turning King and Queen Streets into one-ways from River St. through the downtown core. Queen would run east-bound, Richmond St. west-bound, Adelaide St. east-bound, and King St. west-bound. I would also integrate a two-way separated bike lane. Streetcars and vehicles will share one lane, and there will be two additional lanes for vehicle traffic. This will give cyclists two new east-west corridors while mitigating the ever-increasing congestion problem our city faces. Cars will be able to maneuver unimpeded around streetcars while streetcars will not have to wait for left-turners. Bus shelters could be moved onto the street side of the bike lanes so that transit riders are away from cyclists and this would make more room for pedestrians. New transit routes could be introduced on Richmond and Adelaide Streets allowing multiple options for east-west travel and increased transit capacity for the core of the city. This is an environmentally friendly solution that will reduce congestion and idling time, thereby also reducing emissions. Commute times will also be reduced for everyone, regardless of their mode of transportation. Here is one option that allows for continued streetcar use on existing tracks, lanes for cars to pass safely around streetcars, and protected bike lanes without pedestrian, transit or vehicular obstacles. Curbs can be placed in order to separate bike and car lanes for real protected bike lanes. If bike lanes are placed on the right there is space for TTC passengers to wait and load without obstructing the bike lanes. Because this uses the existing track this will be accomplished with little more than painted lines, one-way signs, a curb and relocating some transit stops and this can be easily implemented before the PanAm Games in 2015. Dedicated bike lanes introduced to date, on Sherbourne for example, are widely criticised, including by cyclists, because TTC buses stop and load across the bike lane, blocking through traffic and cyclists at every TTC stop. These smart value-for-money ideas to get Toronto moving as well as introducing bike lanes on Gerrard St., east of Coxwell, are my proposal for 20 KM of NEW bike lane in Toronto without the need for any major construction and that will not aggravate vehicular traffic.